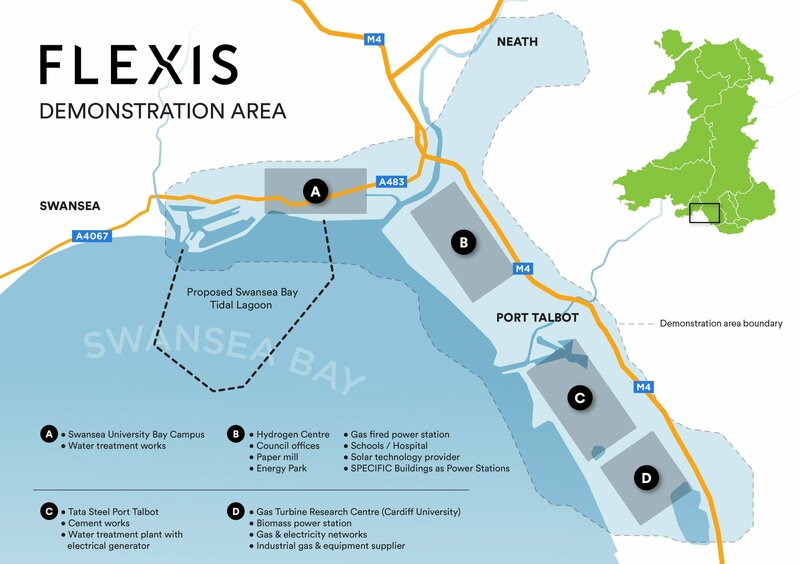 The FLEXIS Demonstration Area is based in Neath Port Talbot, from the Tata Steel Port Talbot steelworks stretching around the coast to the proposed Swansea Bay Tidal Lagoon. 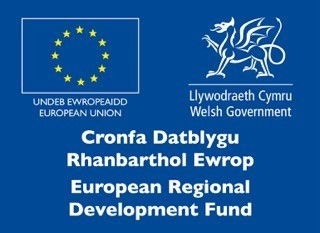 The electrical generators within the demonstration site include two biomass power stations, a CCGT power station, a Solar farm, a wind farm and the proposed Tidal Lagoon. In terms of consumers the demonstration site includes the steelworks (with onsite electrical generation from waste gases and heat), Welsh Water Treatment plant (with onsite electrical Generation), the cement works, the paper mill, the Amazon warehouse, BOC Industrial gases plant, Schools, hospitals, council offices, the University of South Wales Hydrogen Centre, Cardiff Universities Gas Turbine research centre and Swansea University’s Bay Campus. The concept is that FLEXIS will model the energy and CO2 flows in the region and then start to explore synergistic efficiency opportunities. Energy, in terms of Heat, electricity and gas, will be modelled to enable alternative fuel and energy sources, networks and storage options to be explored. The CO2 emissions will be modelled to determine any net emission reductions plus then to assess the potential implementation of Carbon Capture and Utilisation plus CO2 storage. FLEXIBLE energy systems, District heating, energy storage, alternative energy sources, the Hydrogen economy, Carbon Capture and Utilisation, CO2 storage (and export) will all be investigated through the modelling and the other work packages associated with FLEXIS. This is thus an exciting opportunity to not only improve the resource efficiency within the demonstration area but also to improve the flexibility of the energy networks, reduce waste and CO2 emissions from the area. It is envisaged that FLEXIS will not only help to improve the success of those business’s with in the demonstration area but also highlight the potential for new business and regional development.